This is the Expert Catalogue and Data Management GUI Prototype of the Spatial Information Platform (SIP) of the SWITCH-ON EU FP7 collaborative project. Besides advanced data and meta-data visualisation, search, and manipulation functionalities, the SIP Expert GUI covers the whole cycle of publishing, binding, finding and repurposing of open data. The Expert GUI is implemented by SWITCH-ON partner cismet on basis of the cids navigator as integrated desktop application which can be run from the Internet (Java WebStart). It is intended to be used by verified experts and members of the SWITCH-ON project only. 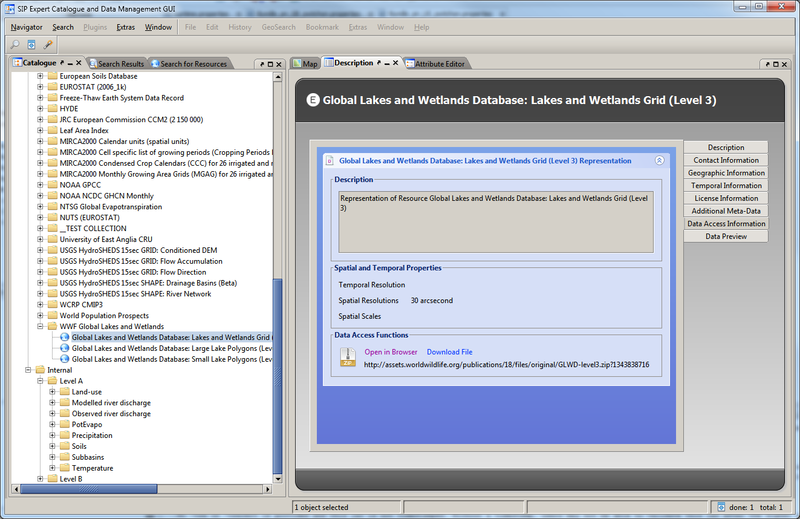 A light wight HTML5 version of the SIP GUI for finding and binding open data is currently under development. According to the architecture of the SIP the GUI layer of the SIP architecture contains several user interface and user interaction components for expert and external users. The general concepts of the Spatial Information Platform are briefly explained in the SIP Concepts presentation. The Expert Catalogue and Data Management GUIs cover besides advanced data and meta-data visualisation, search, and manipulation functionalities the whole cycle of publishing, binding, finding and repurposing of open data. As mentioned before, the Expert GUIs are implemented by SWITCH-ON partner cismet on basis of the cids navigator as integrated desktop application which can be run from the Internet (Java WebStart). This document described the generalised uses cases and related requirements on components of the Spatial Information Platform (SIP) for the SWITCH-ON project that have been derived from D2.1 “Spatial Information Platform and Application Programming Interface”, D2.6 “Standard Information Model: Definition and Description” and user requirements expressed by WP3 “New forms of Research” and WP4 “Products and services”. This document represents a software design document that has been created to drive the development of the SIP Expert GUI. All features specified in the design document have been implemented in the current development branch of the SIP Expert GUI. The Developer Documentation wiki of the SIP Expert Catalogue and Data Management GUI (cids-custom-switchon) contains useful information for developers of the SIP as well as for individuals involved in the installation and maintenance of the SIP instances. The executable software of the SIP Expert GUI is distributed online as Java Web Start Application (see Running the SIP Expert GUI). Therfore a download and a local installation of the software is not necessary. However, binaries (development builds) and source code are available on the Artifactory and GitHub repositories. The latest release of the SIP Expert GUI can be started via the following JNLP Link. Please note, that the Java Runtime Environment 1.7 is required run the SIP. The minimal system requirements for running the SIP Expert GUI besides the presence of a Java Runtime Environment are a PC with at least 2 GB of RAM. 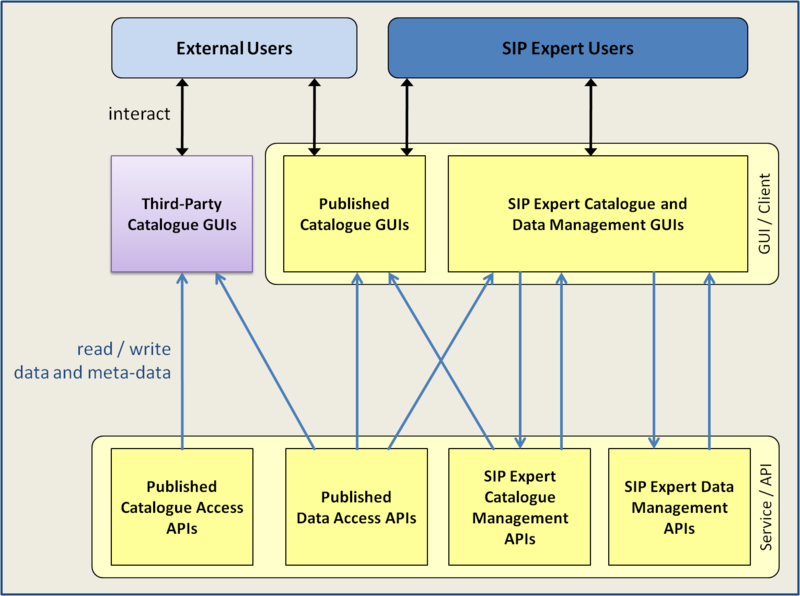 The following interactive user guides in form of instructional videos have been provided for all aspects of the SIP Expert GUI to help users understand and use its advanced publish, find and bind functionalities. This video provides instructions on how to run a JNLP file and start Java Webstart Rich Internet Application from the Internet. This video showcases the basic functionality and features of the SIP Expert GUI. It instructs users how to browse the catalogue, how to show information on objects in the catalogue, how use the powerful geospatial visualisation capabilities of the map component and how to use wizards.